During the winter months I spend a lot of time decorating my interior. 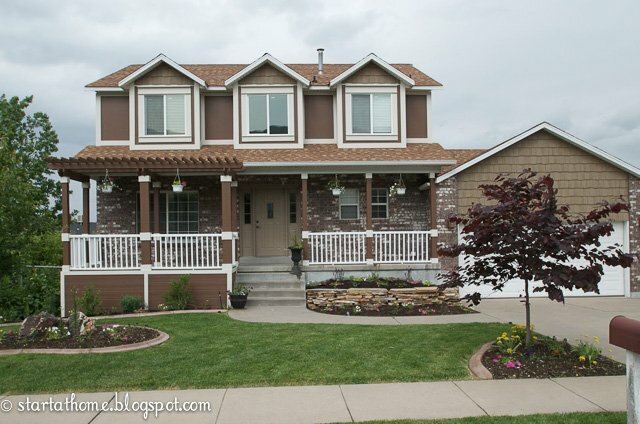 Now that spring is finally in season, it’s time to start working on the exterior and add some curb appeal. I always wanted a big porch to decorate, and now I have one. 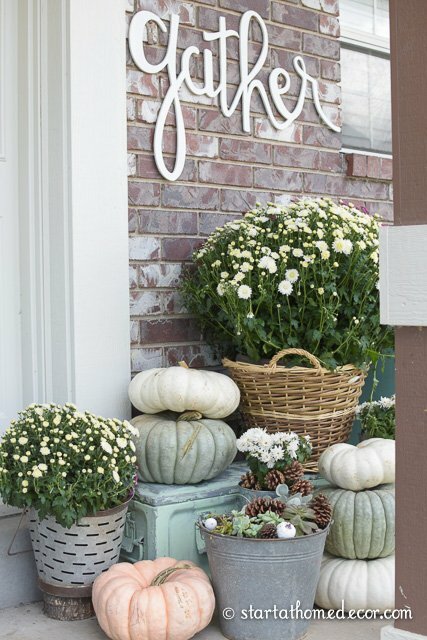 As the front porch is the one place that everybody sees as they drive past or come up to your house, ideally I like this to be decorated and inviting. 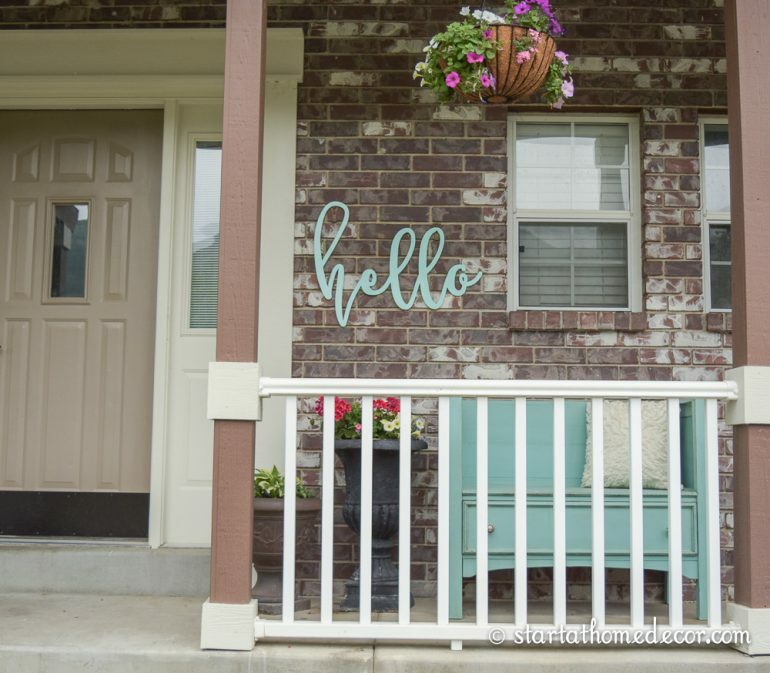 However, some times it just isn’t in the budget to completely revamp my front porch, so here are 4 low budget high impact ways to add curb appeal. Most people do not have thousands, perhaps even hundreds of dollars to spend on spicing up their exterior decor. However, these simple and very minimal changes can make a major impact! I have always wanted a new door. Our door is the basic metal builder grade door. So, I started shopping for new doors… and WOW! 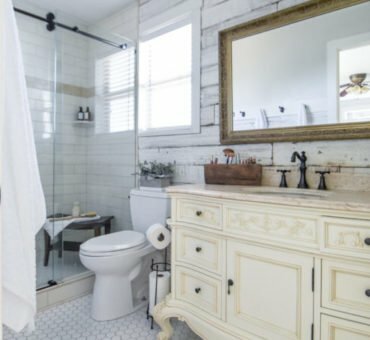 All of the doors that I wanted were over $1500 and that was not in the budget. As you can see, our front door doesn’t stand out. But then, my husband had the best idea. He suggested that we case in our door. What a difference this simple change can make! Consequently, our front entrance looks like there is a brand new custom door. You can see our full post on how we did this here. 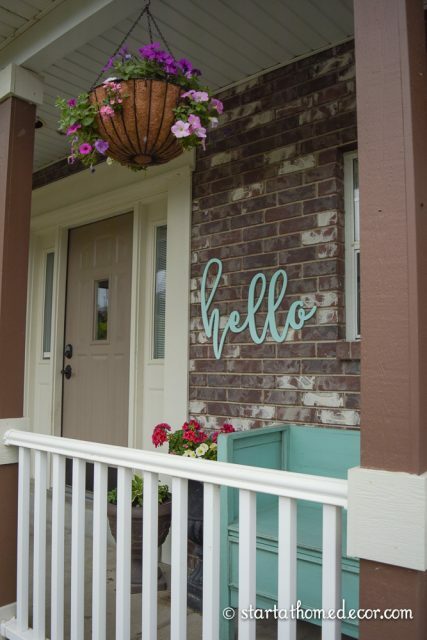 Adding flowers and greenery to your porch creates a big impact. 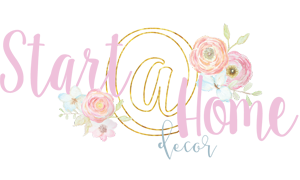 They bring in lots of colors and textures, making your porch and home more inviting. 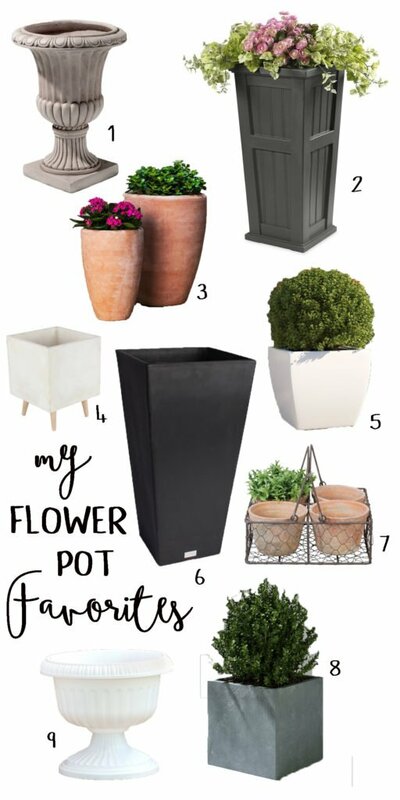 But, planting flowers in pots doesn’t have to be expensive. As it happens, I reuse my pots each year and plant my own flowers. You can also get creative with what you plant your flowers in. I used 2 galvanized pots I bought at a garage sale for $5 this year. It is also very easy to take containers you already have and paint them for low cost. 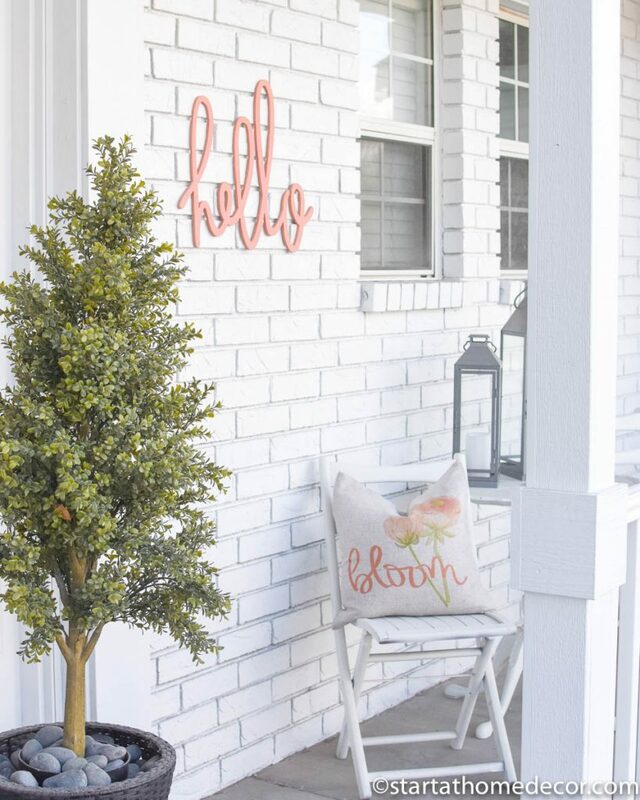 Adding color to your porch really helps to draw people in. We do have a big front porch so I incorporated some of my larger colorful accessories. You may remember my dresser turned bench (post here)… well, it has finally found its home on our porch. It adds the pop of color I was looking for. 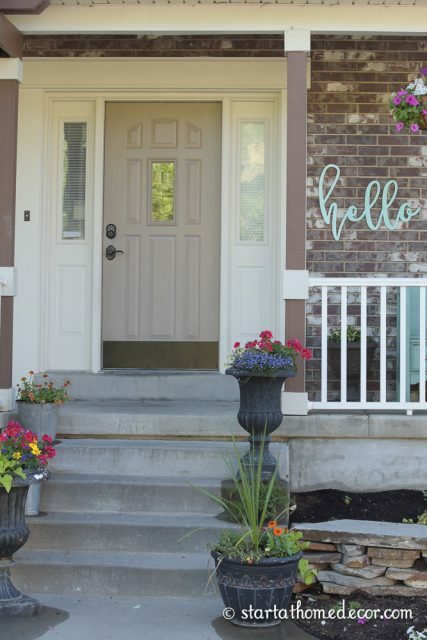 If you don’t have a large porch painting your front door a color is a great option as well. 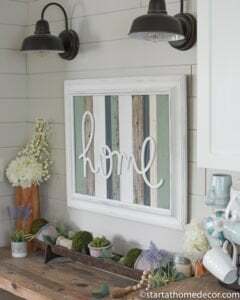 For our door I wanted to go neutral and tie it into the color on our home so I opted to add color through my accessories. 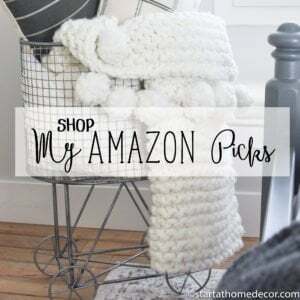 Also, adding a few fun accessories is a great way to really set your home apart. While I preferI to go minimal on my accessories, they need to have a big impact, like our hello sign! 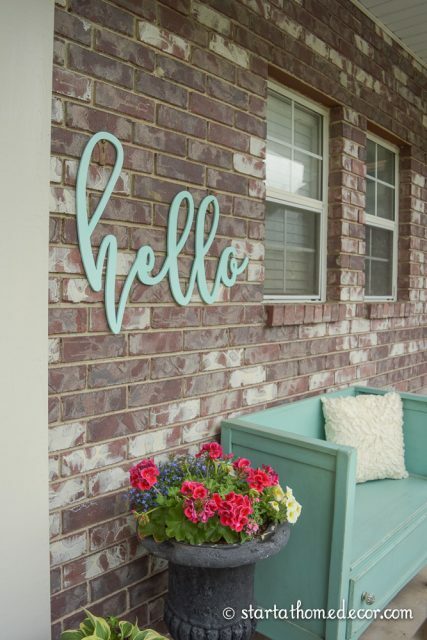 This hello sign is the perfect welcome to our guests… and they are super easy to hang with brick clips!! 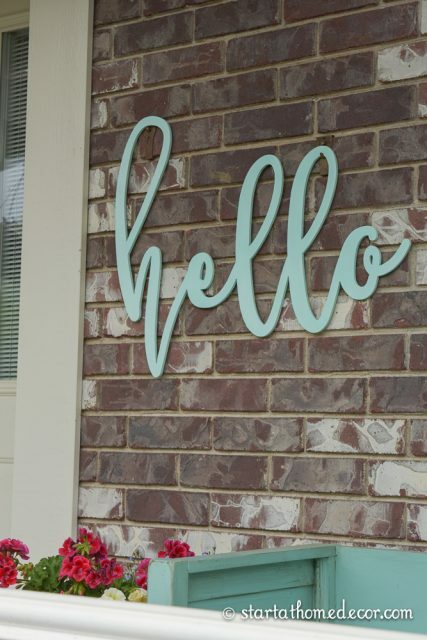 This hello sign is 29″x23″, … making it so you can clearly see it from the road! You can buy similar ones here. I also added this cute pillow to the bench to make it feel cozy and inviting. And, last summer I sprayed the exterior of our home white. You can see that tutorial here. I also have a video tutorial here. I also added a hello cutout in a beautiful coral pink for spring. But most of all, I love how it makes my front porch just pop. 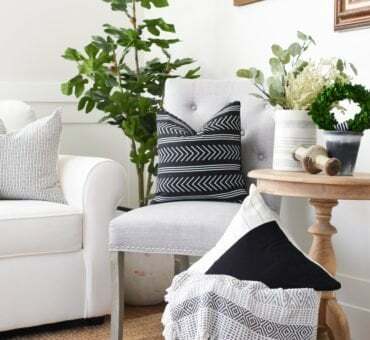 Another great option are toss pillows. These are not just for interior use!! I added these gorgeous spring pillow covers. You can view some similar ones here. 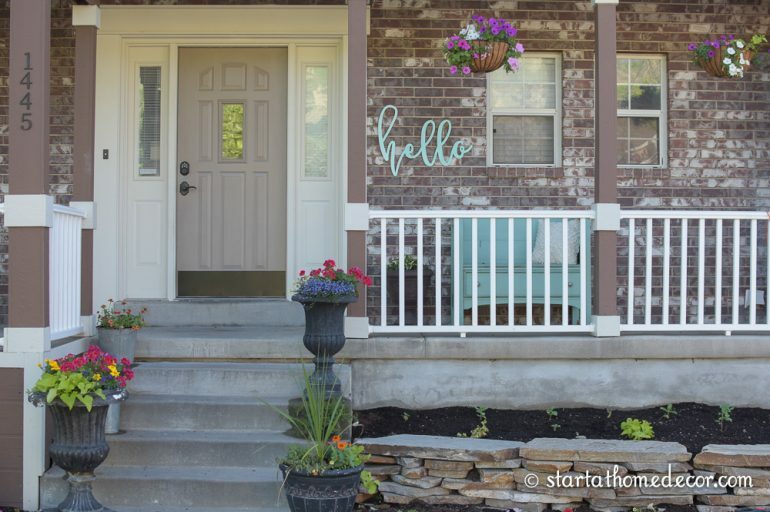 Our once sad exterior has been brought to life with these 4 low budget high impact ways to add curb appeal to your home! You can see how I changed things up for fall here. New Handwritten Word Cutouts are Here!! Very nice! What color is your front door? What is “casing in” your door mean? Sorry, it’s hard to see the difference in the picture since the first one is from farther away. Also your link is not working to explain your process. The moldings around a door are called casings! The link is working now, sorry about that. Do you know if they have clips for siding? What does that mean, to “case” in your door? The moldings around a door are called casings! Great ideas, Brooke! Loving the flowers and the touch of teal!! Amazing the difference a tiny bit of color can make. Our biggest change was painting our front door a new color. Gave instant pop & curb appeal. I just received my hello sign, and I LOVE it. Quick question, did you spray paint yours, or use a roller or brush? Thanks! Ok where did you get the “hello” sign? LOVE it, WANT it! Where did you get this beautiful sign? 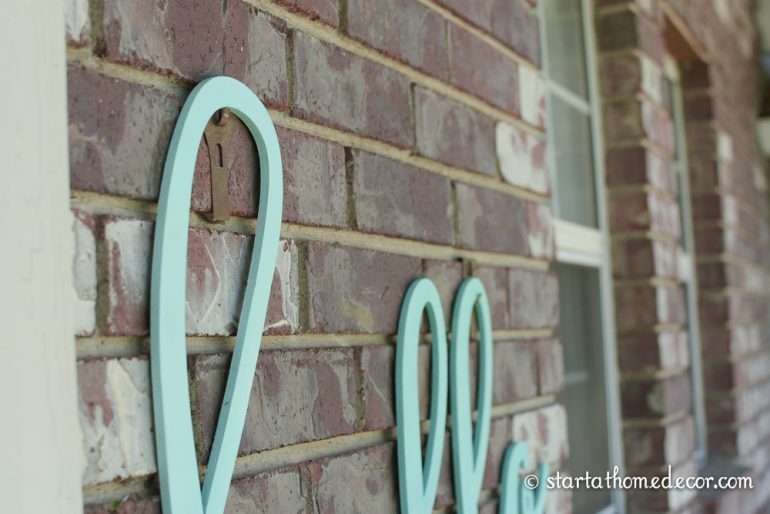 How did you hang your sign on your house?